It has been a shamingly long time since my last blog post and I apologise. The truth is, since the passing of Effie, I have struggled connecting with my girls. Yes I adore them, yes I spoil them and yes I enjoy spending time with them but the sad fact is that none of them are Effie. And I feel awful saying that because I love them so, and they are all so special. They are just not Eff. But my mojo is slowly coming back; I am focussing on mindfulness to regain a little sanity and joie de vivre … and it is early days but it seems to be working. The other reason I haven’t written is that we have lost four girls this year, three of them in one week, and my heart was not strong enough to be able to write about them. Each girl we lose has always had a full obituary and to deny these ladies the same tribute seemed to make them less important, less precious. But that is not so at all. With so many hens passing through I am ever conscious of them not becoming less individual, less of a personality. So eventually I decided that a few words was better than none at all. Girls, please forgive me my human weakness and know that you are all so very precious to me. Little Nell: Little on stature but big on character, looks and charm, Nell was a stunner. She was also very vocal and told me off if something was not to her liking. Every evening she came to tell me very loudly that she was ready for bed and if her bowl of feed, was not in her run, she would pace and shout until I put them there. She did let me have a cuddle occasionally though, although if I cuddled her for too long, she would squawk indignantly at me to put her down. 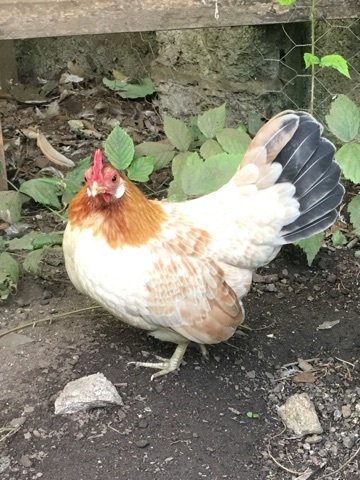 She also had a special spot in the garden, the lowest branch on the hydrangea bush, just high enough to see everything and to put her at eye height with the other hens with just enough covered perchiness to make her feel a real jungle girl. Also, despite her beautiful name, she only really answered to the name Chick, and only then when she wanted to!! 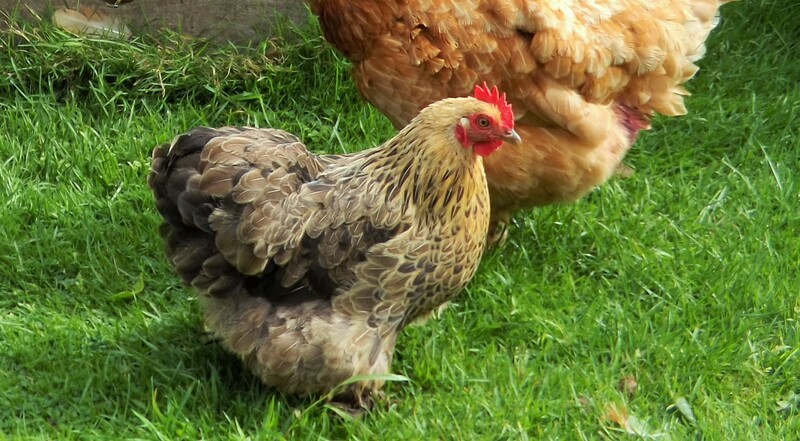 Inca: Inca the Tinker was top hen but bottom bantam (I know!) and suffered from Little Hen Syndrome. She bossed the Big Girls about, all of them terrified of her, but, oddly, was herself always being told off by Iona and Lemony Goodchicken. Initially she had been Effie’s maid of honour and chief preener and she adored her MummyEffie and was never apart from her. She also loved her twin sister Iona with all her heart. She died very suddenly in her sleep, the day after we lost Nell. Margot: Ahh Margot, what can I say about Miss Margot Eggbetter? 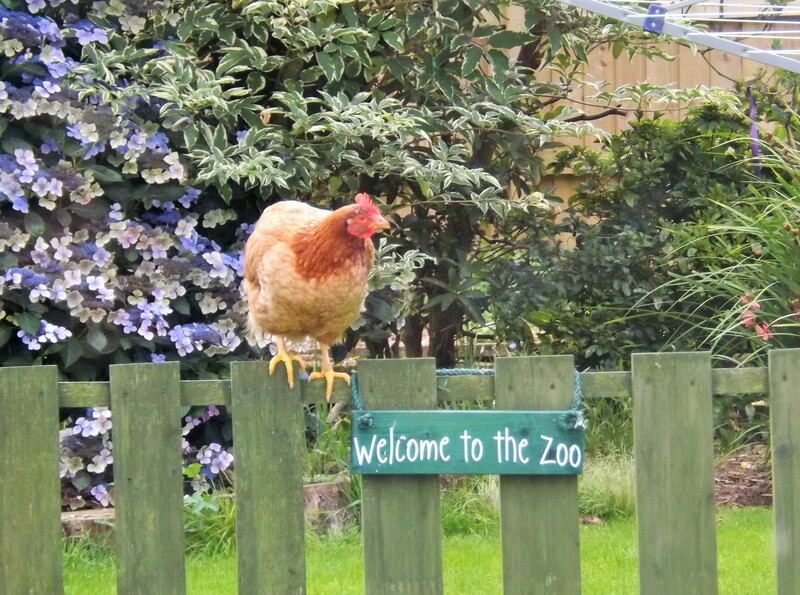 The biggest, bossiest, nosiest and naughtiest hen, she was a total delight. From the outset she was calm and confident with humans and decided that she would be cuddled if she wanted to be, but also that the Human Coop should be hers as well. Always first into the Human Coop, she learnt that if she pecked on the cat flap we would come running. As soon as she sensed a human inside, bang, bang, bang went the cat flap. She also enjoyed standing outside the patio doors, pecking the glass, demanding to be admitted. The cats were terrified of her but her squawk was worse than her peck, she never hurt them. Sadly, poor Margot was a victim of the industry we thought we had rescued her from and it was a tumour that took her precious life. And so we were nine … these three losses happened within a week, and left us and the remaining girls reeling. Then in September our darling Lemony had another prolapse. It was her third and the second within a month. Naturally it occurred at 6pm on a Friday night so we isolated her and tried to put it back in, unsuccessfully. Seeing Jason the next day, he discovered an egg was imminent so he could not suture the prolapse and had to wait for the egg to pass. This bloody egg was huge and caused our darling girl so much pain throughout the day on Saturday but eventually it was out. However, she didn’t really seem herself and by Monday, the prolapse had become infected, tissue had died and the option of putting it back in was no longer open to us. After speaking at length to the vet, it was decided the kindest thing was to end her suffering. Little Lemony Goodchicken was the kindest of souls, the best of hens. Born as part of a hatching project, she, along with Iona and Inca, came to live with us as chicks to keep Effie company after the loss of Miss Basket. 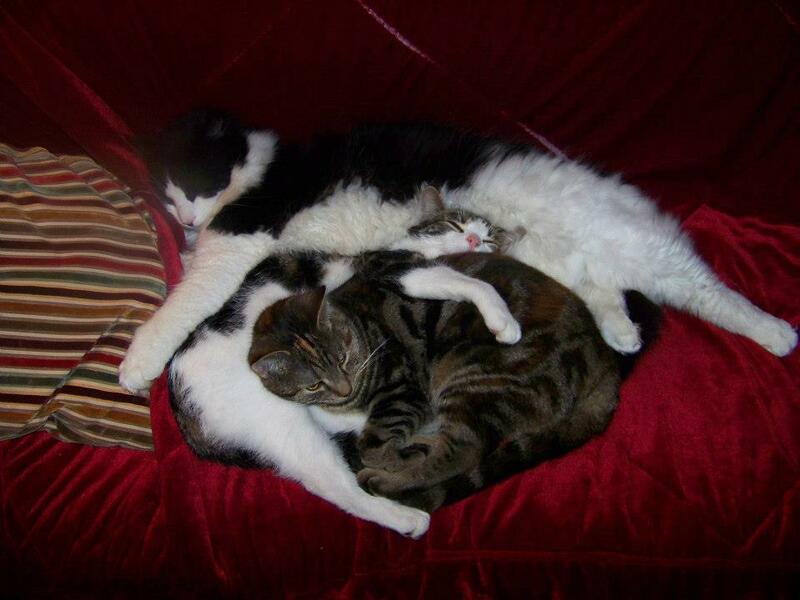 Once Iona and Inca went to live with the Big Girls, Lemony remained to keep Effie company in her dotage. I do not have the words really to describe the love and happiness this little bundle of lemony loveliness brought to Effie’s life; ensuring her last months were passed with love and companionship and for that I am forever grateful to her – she will always hold a special place in my heart. When Effie did pass away, Iona escorted Lemony onto the Big Girls’ garden, where she was met with open wings of friendship. Flora-Jayne took a liking to Lemony, too much of a liking really, but Lemony and FJ became best friends; I think in Lemony’s eyes, a big brown chicken meant love and security. Our garden is not the same without her lemonyness brightening it up. And so, we thought our losses had come to an end, but sadly, a few weeks ago we lost Pumpkin cat. A huge bear hug of a boy he was the kindest gentlest soul – taking on and caring for two mad kittins and then becoming Protector of the Hens. A role he took most seriously; every evening helping us to lock them safely up. He was run over, the driver didn’t brake, let alone stop, and a friend found him by the road. The image of his body is still clouding the happy, loving images I have of him, I hope for not much longer so I can remember him just as he was. But I am still cross, all that love and pumpkinness taken away too soon, just because someone drove too quickly. Just think of the life he still had to live and the love he still had to give; he was only seven. 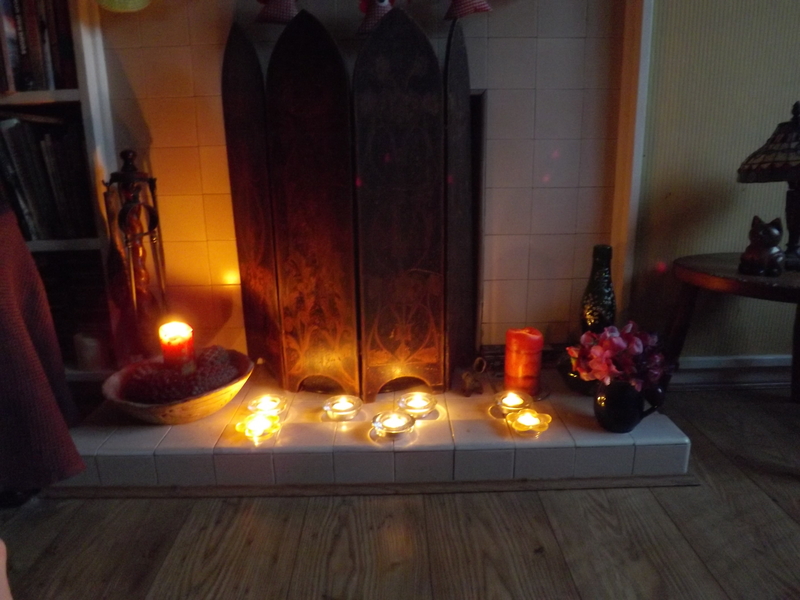 But now, with Samhain approaching, I feel it is time to say au revoir to our ghosts – always there, never forgotten, but we need to look forward, embrace what and who is here with us now. So we shall light candles next Tuesday, oh so many candles, to remember all those that have left us but whose spirits are still with us. This post has gone on for a long time, I am sorry, if you have made it this far, congratulations, you were in for the long haul! I hope I haven’t depressed you too much. Things feel much calmer now, just writing about it all is cathartic. So onwards and upwards. Oh and we have a new superstar in our midst. I won’t say too much but will save it for the next post but suffice to say Milly is gathering quite a following!! Oh my darling girl, my Greta. I cannot believe that you have left us. We have gone through so much together to keep you healthy and happy and then, in the prime of health, you decide it is time for you to go. We never got to say goodbye to you, to tell you we loved you and to wish you godspeed. But what was the very best way for you to go – suddenly, painlessly and in your sleep with your sisters around you – was perhaps the hardest for us unsuspecting humans to bear. My darling girl, I wish I could cuddle you one more time. My sweet Greta was rescued in October 2012, one of three poorlie girls we took home from our rescue. A large, red swollen bottom meant my ever pessimistic prognosis was not good (but what do I know eh!!?). Initially Greta lived with the very poorlie Gina and the not quite so poorlie Grace Kelly in what was yet to be named Effie’s Garden. 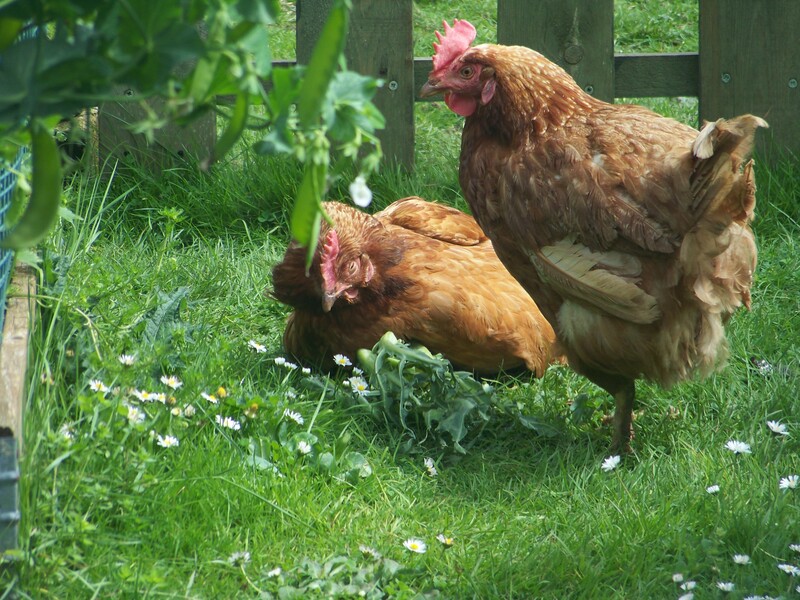 Sadly, Gina died soon after rehoming but Gracie the Pickle and Greta soon decided free range life was far too much fun to give up on and integrated with the Big Girls very quickly. The Goodchicken name, as we know, is very sought after and one not lightly bestowed upon a chicken but Greta seemed to be born for the title. 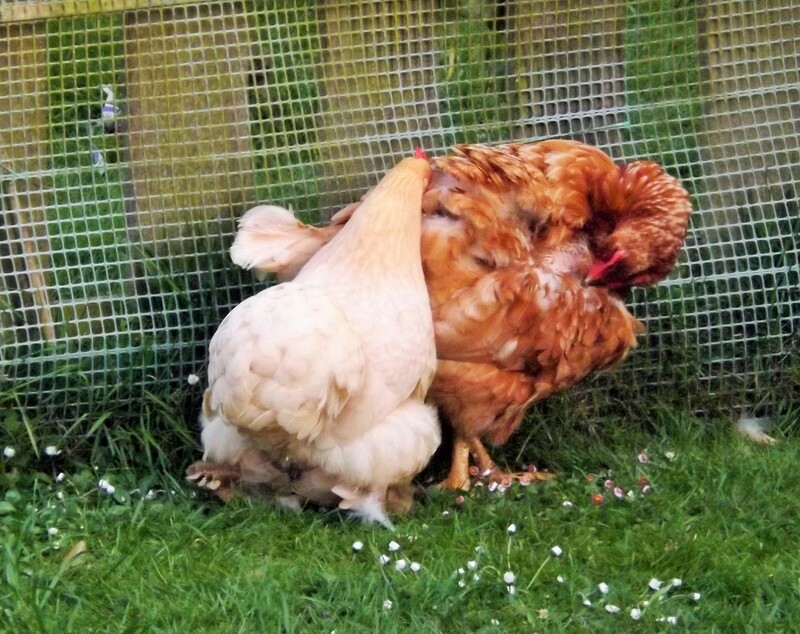 Always one to care for other girls, to clean their beaks (whether they needed it or not), to tend to poorlie sisters and to tolerate cuddles with humans, Greta was always the star. Miss Greta Goodchicken she became, a worthy recipient of Bunty’s legacy. 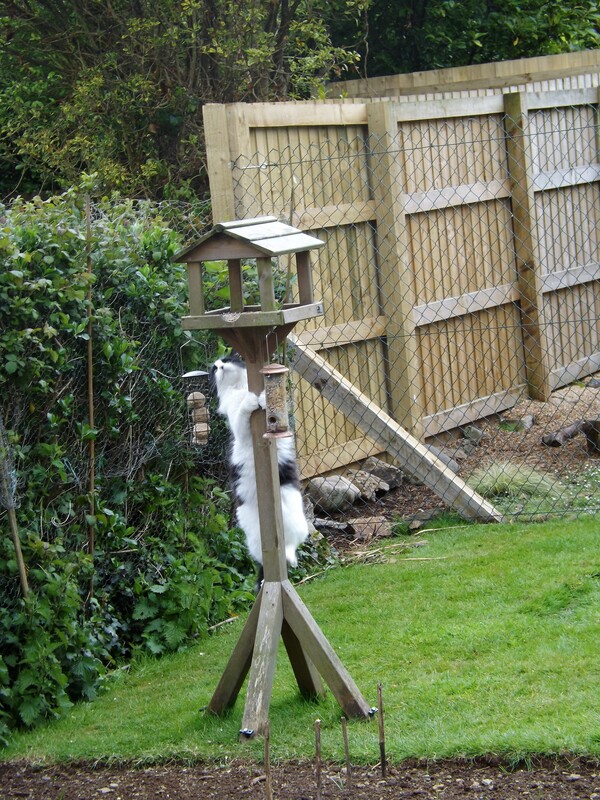 But Greta had other talents…secretly she was also a magpie. She coveted all things shiny. In particular, my earrings. She somehow managed to work out that if she came over to me all cuddly and cute I would bend down to stroke her, dangly earrings dangling aplenty. At this point she moved in for the kill. One of those oh so tantalising silver dangly earrings was whipped out by an expert beak and whisked off around the garden in a ‘really fun’ game. The time it took me to catch both her and the earring were naturally inversely proportional to the weather; sunny and warm meant a quick game, monsoonal rain or hurricane winds ensured a long and oh-so-fun game. You would think after the first time I would learn….it would seem not. Greta 3 – Idiot Human 0. But Miss Garbo also had a thing for mobile phone cameras…or was it just the handsome gents operating them?? When Neil, keen photographer and husband of my lovely friend Jan, came to visit, Greta was entranced by his phone camera, inquisitively posing for shot after shot. As another infamous Rosewarne lady had had a bit of a thing for Neil (Effie who was oh so fickle in her affections had happily trotted across the garden to greet him – the girls can always tell a good egg) we assumed Greta was also smitten. 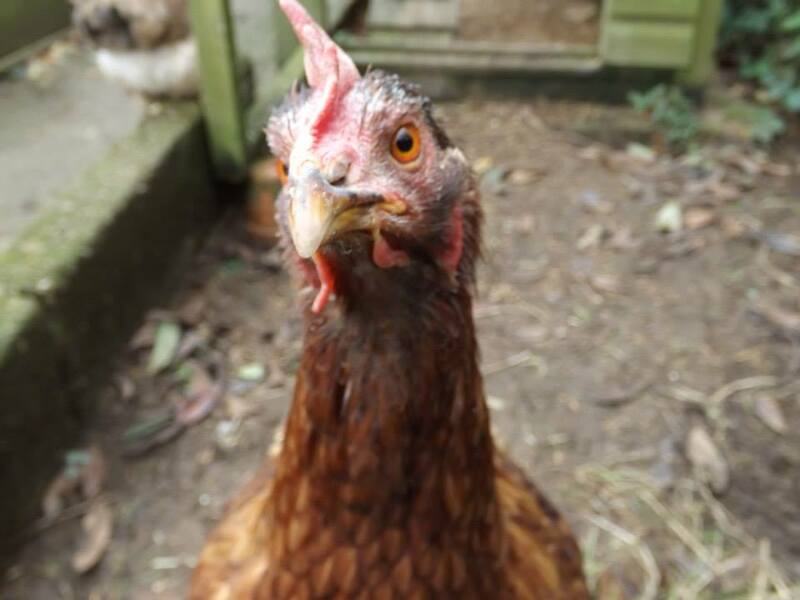 But when lovely chicken friend Pete turned up and started to photograph the girls with his phone camera, Greta assumed the same diva-esque pose. Obviously she loved the camera. And it loved her right back!! Greta’s other special talent was as an egg thief!! Not literally (although given the chance I am sure she would have tucked in) but as she had never laid an egg in her retirement I think her body was sending her eggy feelings. 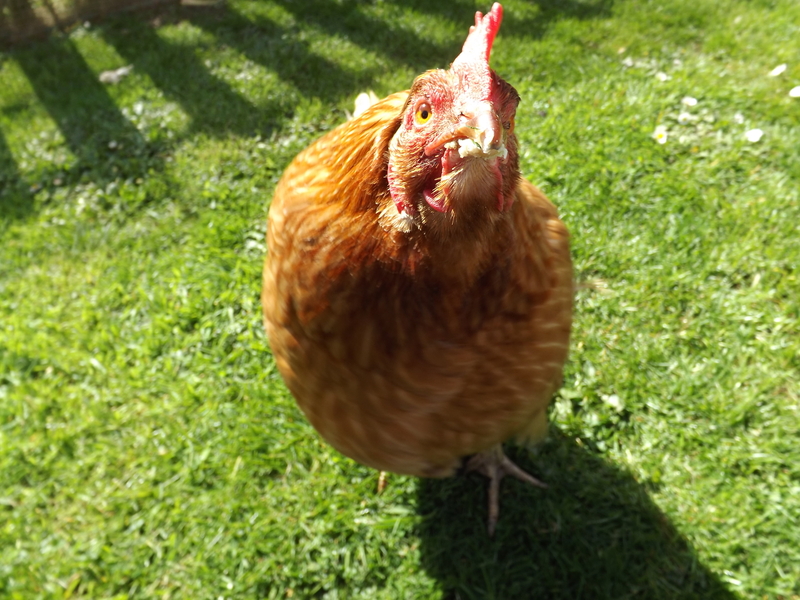 She used to wait outside the coop in the mornings until someone came out announcing the Great Arrival of their egg, before sneaking in, nestling atop the egg for a brief while and then rushing out to announce….Her Egg!!! No one else seemed perturbed by this egg plagiarism, so we congratulated her each day on her beautiful egg and everyone was happy. That tummy though, swollen and red but still beautiful, was always present and caused us no end of problems. We, along with Uncle Jason, tried many many things to help her. 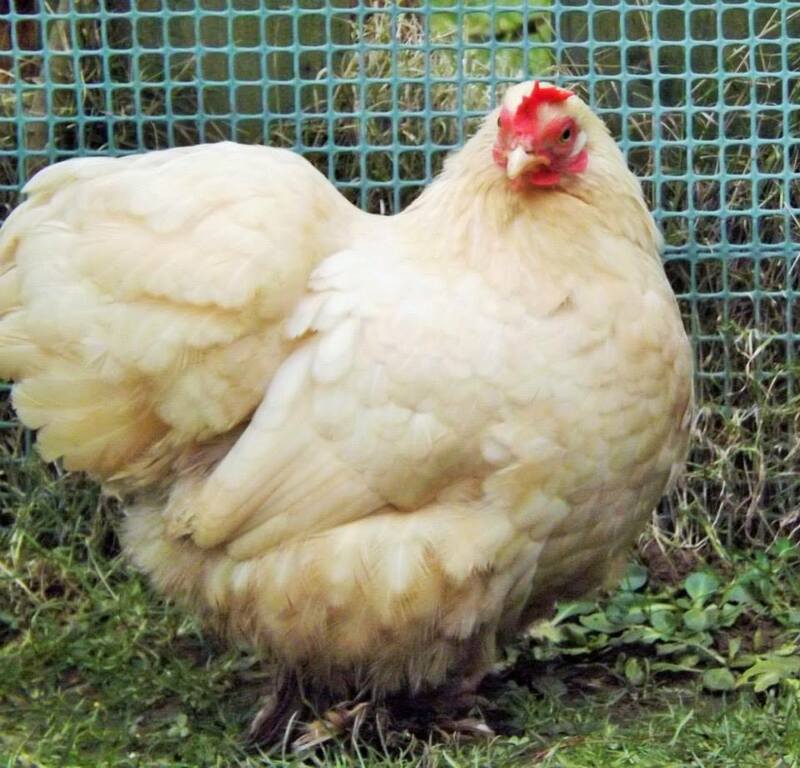 She swelled up in the spring and slimmed down in the autumn but it wasn’t a fluid eggy mass, it was a solid one. Various vetty examinations didn’t reveal anything helpful, deducing it was scar tissue, and in the end a mixture of diuretics and occasional antibiotics seemed to keep any issues at bay. This year, we threw everything at getting her through another summer, mistakenly believing that once winter came we were safe for another year. 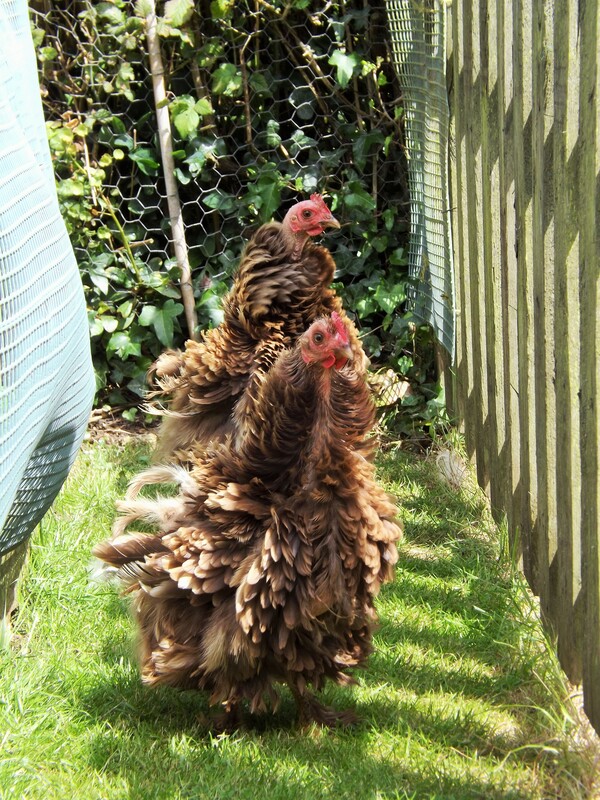 And by her fourth henniversary in October I hoped that she would be OK for a few more months at least. She was slim, spritely and racing round like a spring chicken so I, foolishly, stopped worrying about her. One Friday morning, I opened the coop, everyone trooped out and for once I didn’t do a headcount, lulled into a false sense of ‘all the hens are well’ security. When you have a poorlie girl, part of you always worries that you will find her dead in the morning. When everyone is well, you don’t have quite that same worry. So to open the nestbox and find my darling girl asleep forever was quite, quite horrifying. There had been absolutely no indication she was ill, in fact we had been commenting on how well she seemed. For her, naturally and for all of us, to go to sleep peacefully and surrounded by those we love is the best we can hope for. But for those she left behind it was heartbreaking. Selfishly, we had been denied our chance to say goodbye. 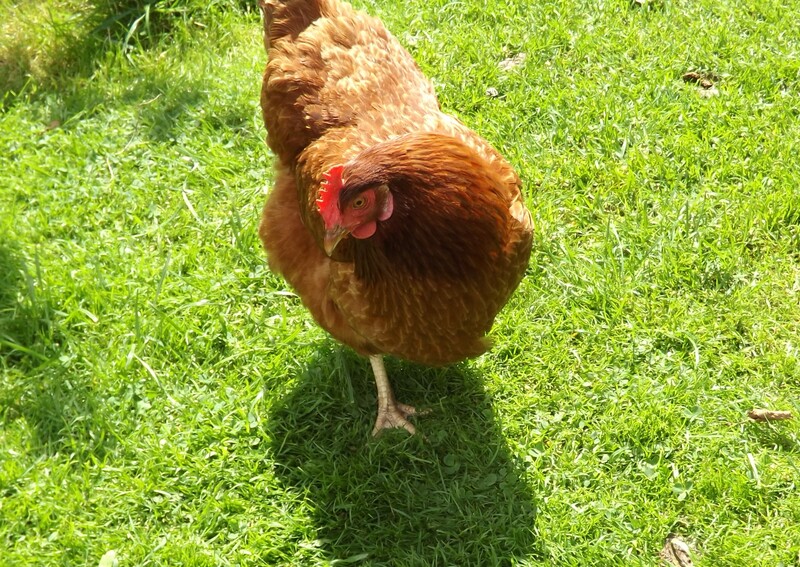 Miss Greta Garbo was a legend in our garden, and in our lives, our longest resident (Flora although a year older, came to us after 2 years’ fee) and our very best girl, central to our flock’s happiness and well-being. 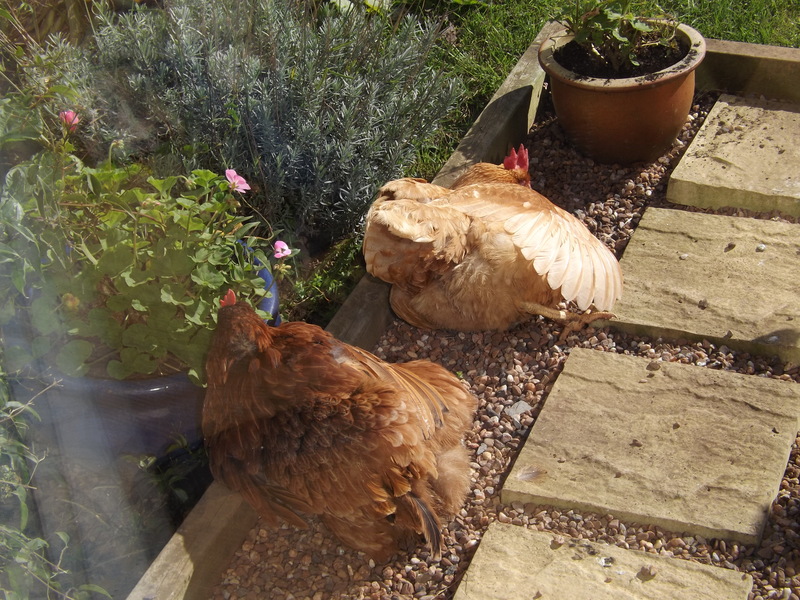 Losing both her and Lavender in close succession has broken our hearts and shattered our spirits – not to mention those of poor Flora who has lost her two wingmen (or women) in the space of a month. I keep seeing her in the garden (as Margot could be her twin sister) and I still talk to her – to all of those that have left us – every day. Greta Garbo was the last of the Goodchickens – a beautiful, free spirit that shall always fly free amongst us. You chose to leave us on your own terms, darling girl, so please take this as my goodbye to you. Saturday 13th of August dawned bright and sunny for the Grand Arrival of our new, bespoke, plastic coop and run. 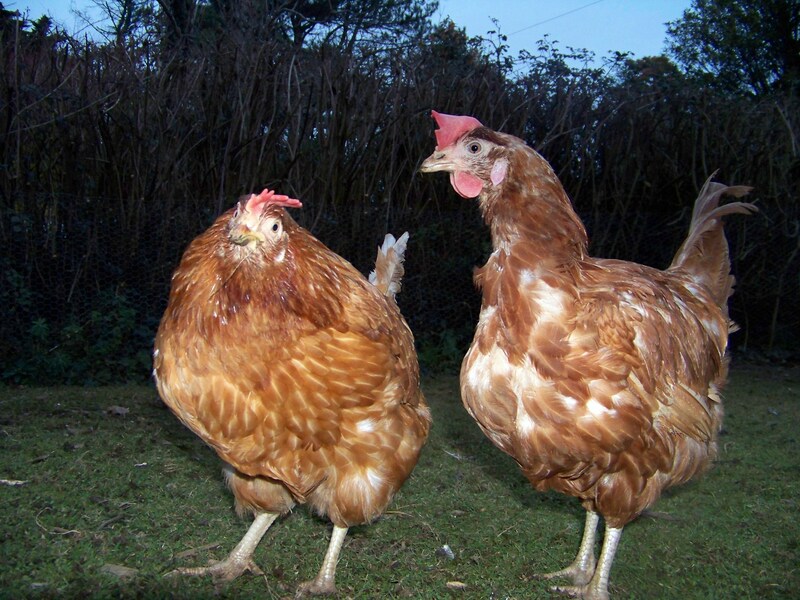 The girls had excitedly packed their bags, taken down their posters in Henderlay and were busy squabbling over bunks in their new home when the eagerly anticipated new coop arrived. We were all like children on Christmas morning, jumping around in excitement and generally getting in the way as Chris the Coop Man tried to put the coop up with much hen ‘help’! An hour later and the coop was up and in place and the girls waved their new friend Chris the Coop Man off before beginning exacting inspections of their new palatial home. Iris T Frizzle was the first hen in the coop as, being broody, we transferred her directly from Henderlay, followed by fellow broodies little Lemony and Iona. I must confess, the coop is magnificent. The company that Chris the Coop Man runs, Arkus Coops is based just outside of Penzance and uses recycled plastic; so at least two boxes ticked there. He adapted the coop to the girls’ and my specific requirements and even made the run to be a tad taller than I am. It is on a special high stand to avoid my bending and has reinforced metal on the run, skirts and around the back of the coop as well very secure locks all over the place. Being plastic means the girls will not have to endure red mite and the coop has plenty of space for everyone and nice low perches for special exbatt physiques. If initial reactions are anything to go by, the girls are very impressed and have enjoyed their very first night all tucked up together. Special times and special memories. I was very impressed with the magic door opener – although I was up early just to check it! This coop and run were crowdfunded by many, many wonderful, kind and generous people. Without them, a new coop would not have been possible and we would have had to patch Henderlay up to try and battle through another winter. Their big and generous hearts have meant a greatly improved quality of life for my girls and a comfy night’s sleep snuggled up together. Exbatts deserve the very best and now my girls can have that. We are indebted to everyone who has helped us and thank you all from the bottom of our hearts. The girls, Gary and I have all given great thought to how we can thank everyone and, even though the girls thought people would each like one of their special eggs (I had to explain the failings of the postal service and the vulnerability of eggs in envelopes), it was eventually agreed on that we will have a memorial page on this blog so everyone who has supported us can have a dedication and photo of the hen/hens/pet/pets in whose name the donation was given. It is a small thing but one that I hope will be appreciated and received with the love with which it is offered. I will be contacting everyone directly over the next few days, although there were three anonymous donations so if they were you, please contact me! Thank you all again, please enjoy the first few pictures of the coop and I look forward to posting many more. Girls inspecting their new home! I knew getting over Effie would be difficult and I had hoped that time would start to ease the heartache but, in all honesty, it hasn’t. Admittedly I am not crying as much as I was and I can recall some of Eff’s quirky little habits and sometimes even smile at things as I remember them. Which is good I suppose. But I also felt I needed to do something. Hers was a great big, fabulous life, lived by a funny, clever and darling little girl who triumphed over all her demons. She changed lives as well as saved them and she needed to be remembered properly, as befits a lady of her great stature. And so Effie’s Garden was born. Effie’s garden, has always been the little plot of humans’ garden between the house and the Big Girls’ garden where Effie lived. 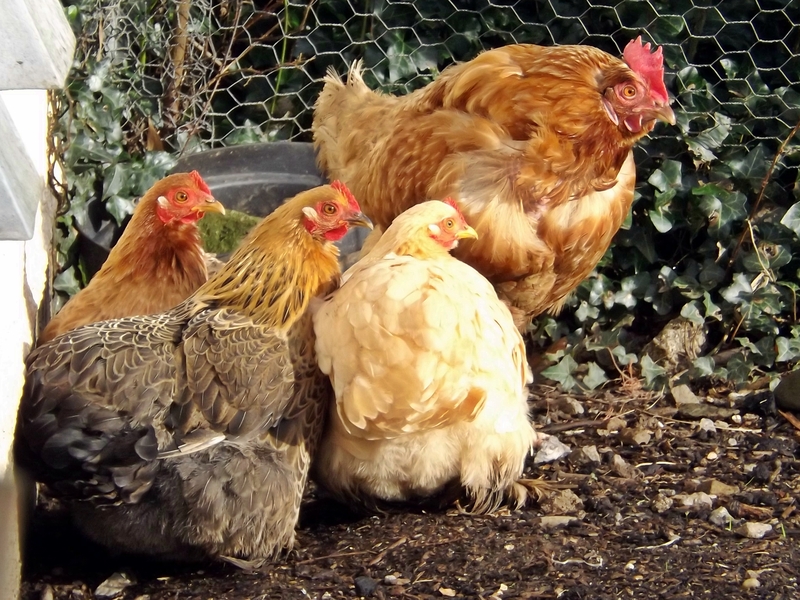 With the arrival of the frizzles in the summer (when Effie was a house hen in her final days), it became a ‘nursery’ garden for the new girls before they were integrated. And come the spring it will be the new home of more ex-batts, before they too head off to live with the Big Girls. I have always wanted an animal sanctuary, but funds and space are limited so I became intrigued by the idea of a microsanctuary. The microsanctuary movement seems to have started in the US (correct me if I am wrong) in North Carolina by Justin and Rosemary who decided that instead of dreaming of a large sanctuary ‘one day’, the fact they had two rescued ex-batts meant that they already had a sanctuary, just a small one! And so Triangle Chance for All and the microsanctuary concept was born. A microsanctuary is probably what many ex-batt keepers are doing already – caring for ex-batts (or any ex-commercial farm animal) in their garden or on their smallholding and promoting the plight of these beautiful creatures. They are more informal than not-for-profit organisations and are usually funded by the owners themselves. 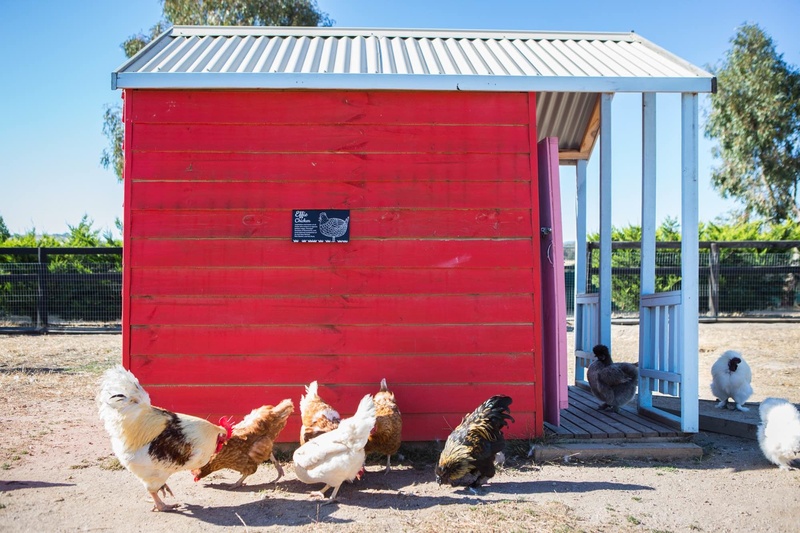 But a microsanctuary can be anything – from one rescue hen in the backyard to a full-sized sanctuary! It is the concept that is more important than the size. When I spoke to Justin, he said Gary and I were already running a microsanctuary, and indeed we pretty much were. But for me, I wanted something more tangible, something that was in Effie’s name and a tribute to her wonderful life. So Effie’s Garden was born. My inspiration in caring for my girls has always been Edgar’s Mission Farm Sanctuary in Australia and so the similarity in names seemed appropriate. 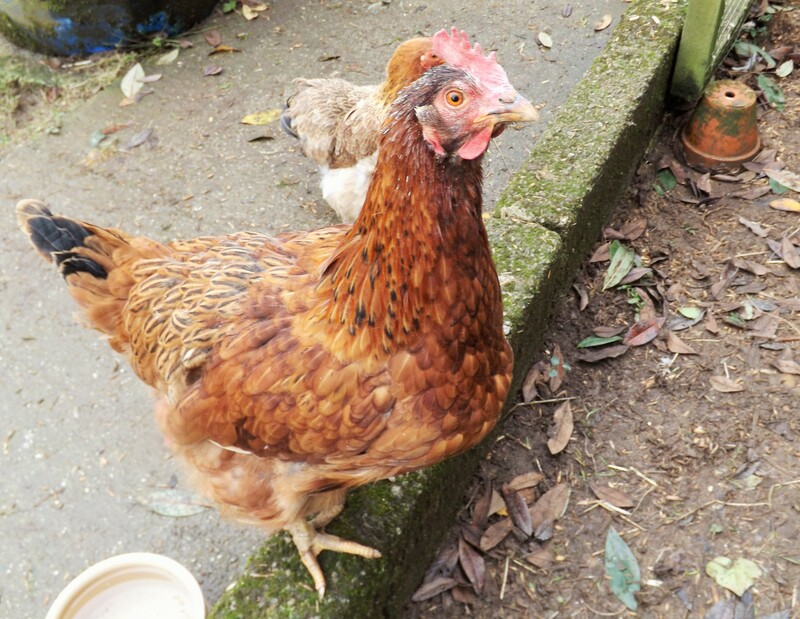 And almost as a sign, at the same time as Effie’s Garden was forming in my mind, an email arrived from Edgar’s Mission, telling me that there is now a coop at Edgar’s Mission dedicated to Effie, that will care for and keep safe some little ex-batts on the other side of the world. 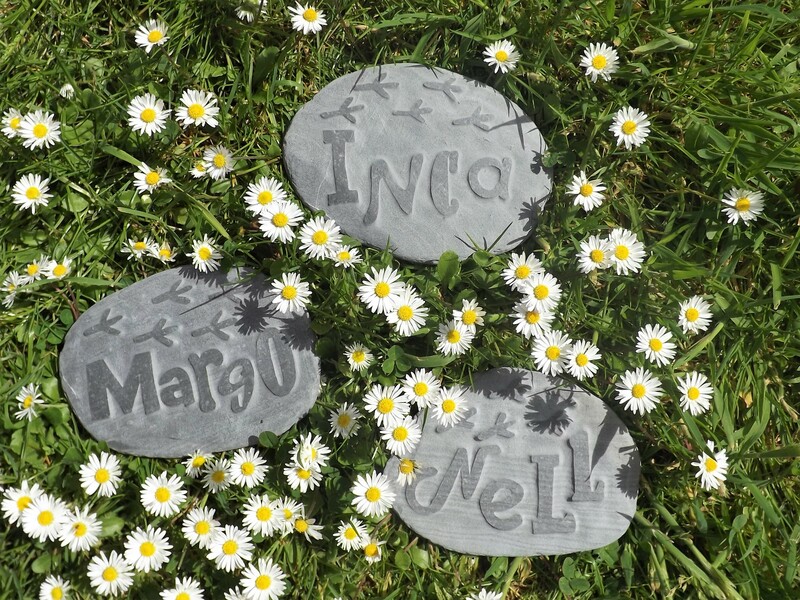 Four very wonderful and caring ladies had sponsored a coop for me in honour of Effie – even now just writing about it makes me cry, it means so much. It is a truly wonderful gift, given with such love and understanding of how much Effie meant to me; Liz, Jan, Quolanta and Helen I love you all. So as the sun sets on Effie’s Coop in Australia each day, so it rises on the coops in Effie’s Garden here in Cornwall. 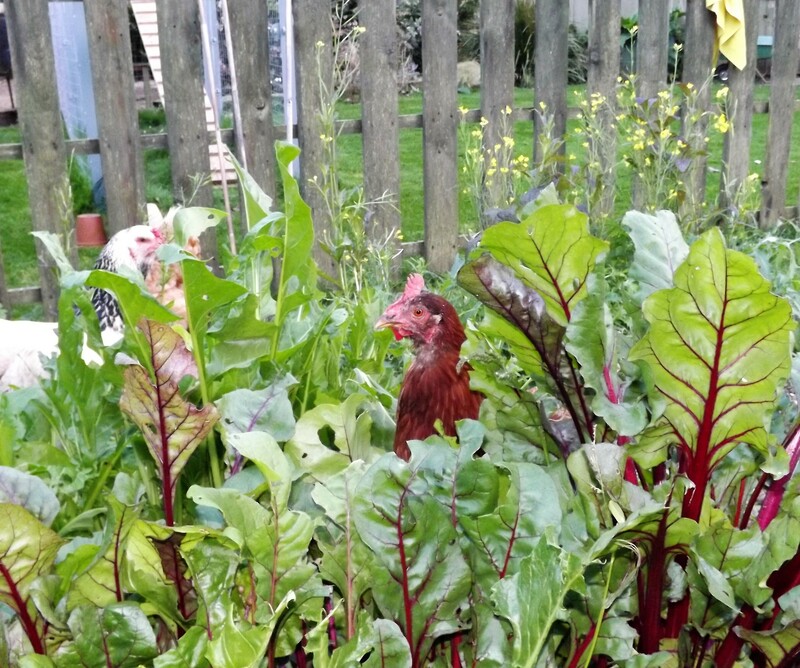 On the surface, Effie’s Garden is very much as it has always been, my little flock of ex-batts and rescued hens flourishes and we excitedly await the arrival of our new girls in the spring. But now I have something a little more structured, in my head and my heart at least, that means I can grow and develop Effie’s Garden, creating something positive out of the sadness. And, most importantly, it means that my girl’s beautiful name and indomitable spirit live on. My little girl is gone and still I cannot believe it. From the day I brought her home, a terrified little bundle of feathers, Effie’s death was something I feared every day. Now that she has left me, I simply cannot comprehend it but must somehow learn to face life without her. Effie’s tale is much documented – in this blog, in magazines and books and in exhibitions across the world, she became something of a legend. The little hen with the twisted neck (that gave her beautiful body her unique shape) who overcame physical and emotional traumas to find love and happiness in the Cornish sunshine with her beloved Miss Basket and then, with the tragic passing of Miss Basket, she learnt the wonders of motherhood with her three bantam babies. I have many, many wonderful memories of Effie in my head, my favourite is possibly the image of her, a new ‘mother’ standing in the coop at bedtime, her leg cocked in a most unladylike fashion, awaiting the three little feathery bundles who loved to tuck themselves underneath their new mum each night. Effie had a big, brave, beautiful and loving heart. 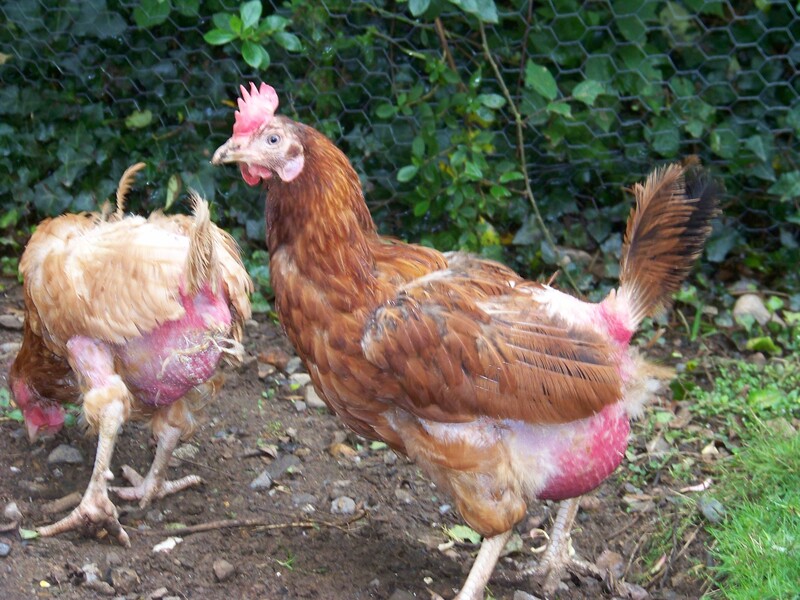 However, whilst my girl was enjoying every moment of her free range life, her precious body was slowly succumbing to the scars of her caged life. She had been suffering from a suspected brain tumour for a while – the weeping ear a sign something sinister was lurking inside her beautiful head. In recent months she had increasingly been suffering from panic attacks and was generally slowing down. But about two weeks before she died, she suddenly went blind, or at least lost much of her vision. She was unable to judge distances and walked into objects. Knowing now, that the much dreaded end was in sight, we brought her inside the Human Coop – where she had been spending more and more time anyway with Lemony being broody. 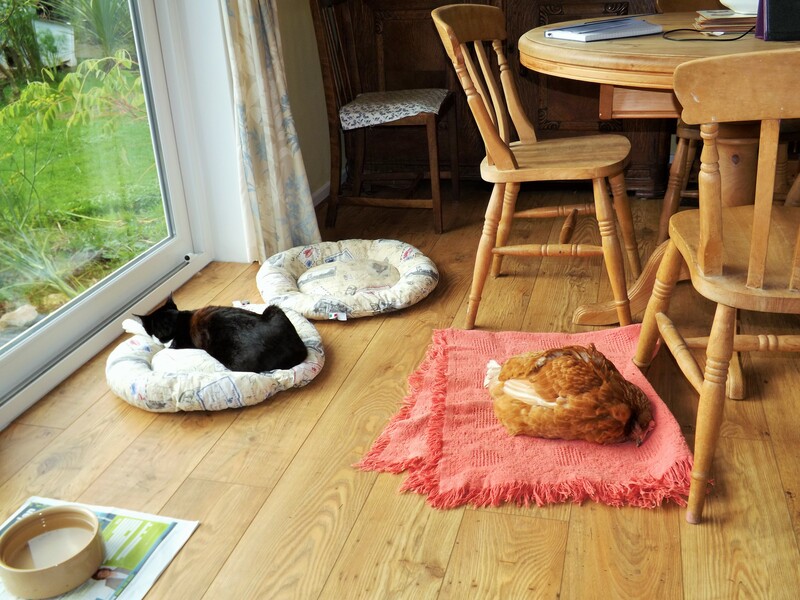 We adapted the Human Coop to her needs and she seemed to be coping well. The specialist vets assured me as long as her quality of life was good, then she would be fine. And Effie was happy in the Human Coop, she considered herself human anyway, and had come full circle. She started her life with us in the Human Coop almost four years ago, it seemed fitting it should be where she ended it. For about ten days all was well, she ate, slept and pootled about the house, but then signs started to indicate that things were going downhill all too quickly. Always a girl who loved her food, suddenly her appetite wasted away to almost nothing and she started to be a little unsteady on her feet. You try and ignore these things, as they are indications of something too painful too comprehend, but then on the Tuesday evening she lost the ability to walk, she fell onto her face repeatedly, panicking and screaming. That all important quality of life was deteriorating rapidly. Knowing what awaited us on Wednesday I spent the night cuddled up with her on the sofa, calming her by talking to her, stroking her feathers and keeping her safe. It was the longest night, but also the shortest night. I tried to tell her how much she meant to me, to so many of us, and she heard me and replied with her gentle bwarks, but there would never be enough time to tell her how truly amazing she was. Our bond went beyond human and pet but was a meeting of spirits. She had been waiting for me and I for her. And now it was time for me to do the hardest but also the kindest thing. An Effie cuddle was always an honour and a privilege but none more so than when I held her in my arms, as she passed away, slipping peacefully from this world. She died being told how much she was loved and that Miss Basket was waiting for her. And I find a little consolation knowing that Effie is now forever reunited with her beloved Miss Basket. She was cremated the following evening, a garland of sweetpeas over her body and under her wings and a bouquet of sweetpeas on top of her pink shroud as her spirit soared skywards. In what was the darkest of days for us, a little ray of hope and love flickered in all the beautiful candle tributes people lit for her – not just in the UK but across Europe. We were unbelievably touched by such kindness. 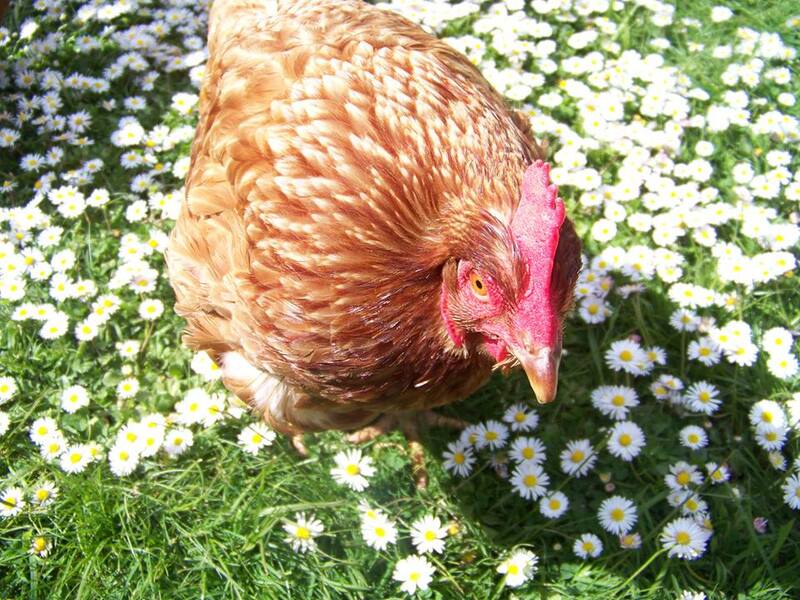 No words I can write will ever do my Effie justice so I need to make her name and spirit live on to help other hens. 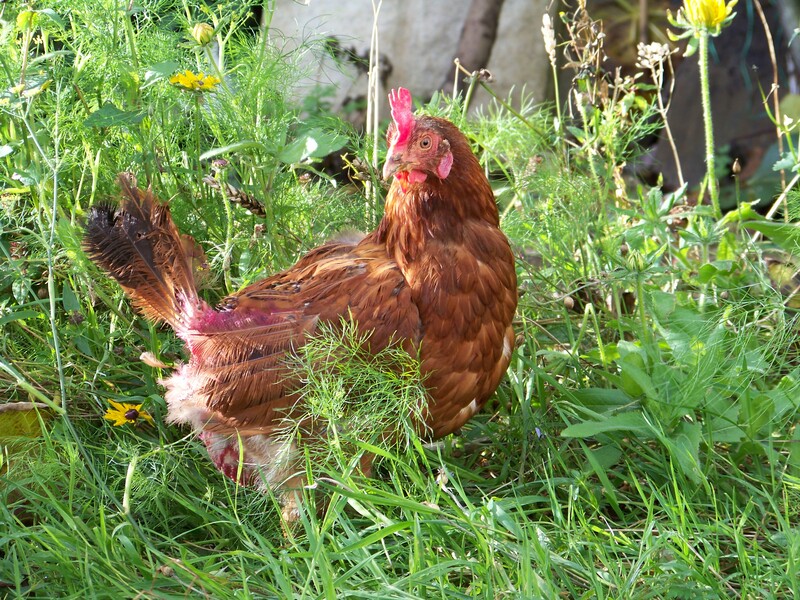 Effie’s Garden (as it will forever be known) is already the garden for special hens that Effie had always planned it should be. 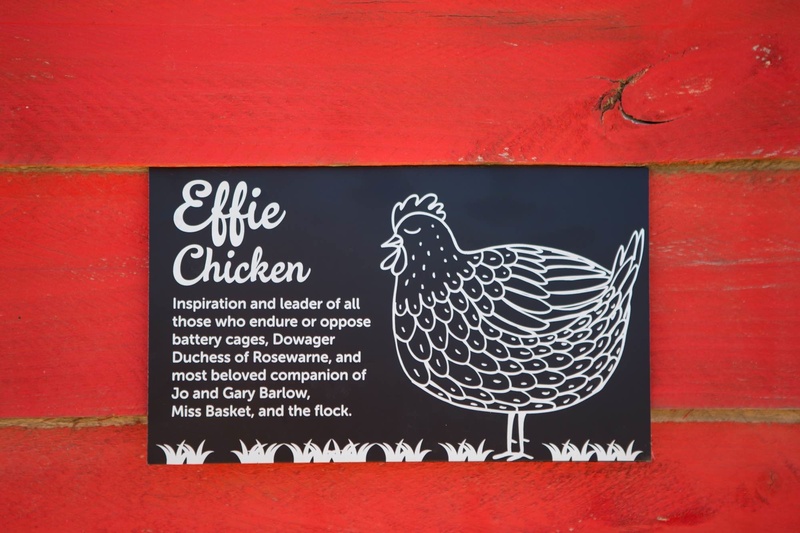 People contacted me during her lifetime and more so since her death to say that she had made them view hens differently and that Effie’s story had inspired them to get their own hens. To think there are ex-battery hens enjoying a life of freedom today because of Effie, means my girl has left an amazing legacy. For myself I need to do something else for Effie’s memory, as yet I do not know exactly what, but it will come to me and she will guide me. The love and energy that was my little Effie will find a way to truly live on. For anyone who has ever had, and lost, ex-batts they will understand just how much these girls mean to you. There is something undefinably vulnerable and yet invincible about them. After the abuse they have suffered, still they have the heart to forgive humans, to love us and trust us. I never fail to be humbled by their humanity. And to me, Effie was the epitome of all of those emotions and characteristics. 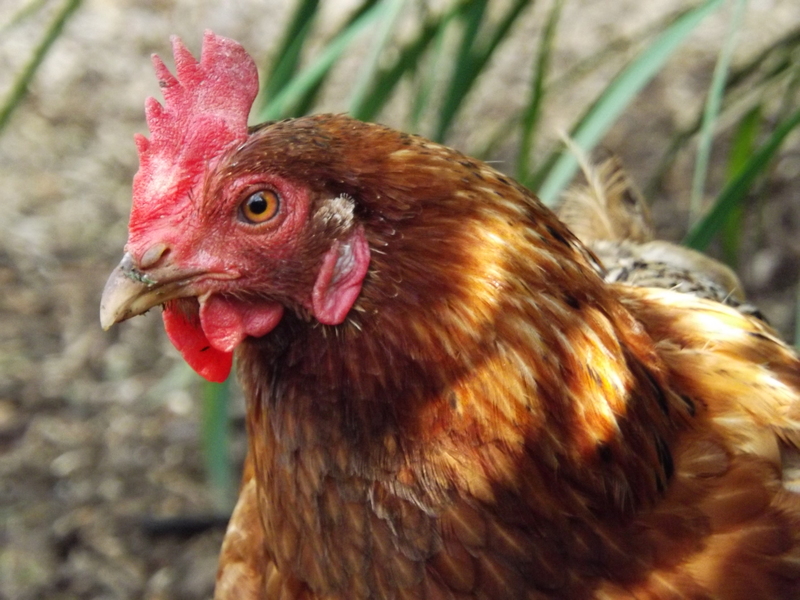 She was more than just a special chicken, she was a symbol of hope for every commercial hen across the world, every animal who suffers abuse at the hands of humans. And she was my world. But still, I cannot believe she has gone. Losing her has broken my heart. But the blessing of having known her and to have been the recipient of all the love a little chicken could give to a human will somehow hold my heart together and make me strong enough to face a world without her.